It is almost always better to see data in a plot than as raw values. 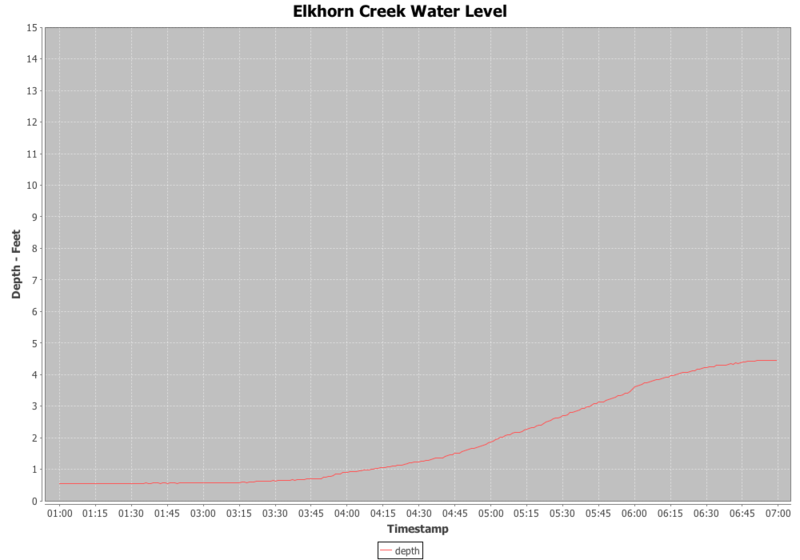 I knew that I wanted to be able to see the Elkhorn Creek Water Level. The charting software that I am using has been done and re-done several times (including as I prepared this post). I was committed to using Java and I wanted to find a toolkit for building charts. After searching around on the internet a bit, I settled on JFreeChart which is an open source Java based plotting package. I like to contribute to the good work of people so I bought the developers guide for $65 and it was well worth it. I knew that creating a chart would take a bit of CPU and that the Raspberry Pi was a bit under powered as far as that goes. This lead me to create a batch program which I run via crontab directly after I have collected the data (once per minute). It appears to the web user that the chart is “fresh”, but really it is up to 1 minute old. The second block of code (lines 20-26) setup global configuration variables which I declare as “final” so that I know that they are immutable. It probably would have been better to make the filename be configurable with the command line arguments, but that is something for another day. Publishing the MySql User and Password would be a problem except, that user can only access the MySql database from inside my network. The last block of code (lines 32-40) just prints out the command like usage if they program is run with the “-help” argument. The next step is setting up the Start date/time and the number of hours. 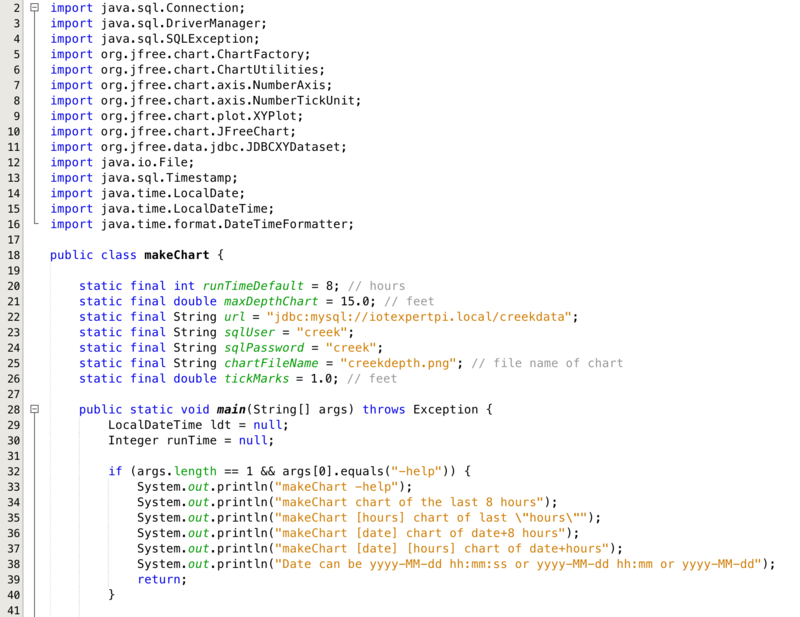 Java has a cool class called “LocalDateTime” which I use to represent the starting time of the data. There is an absolutely mind boggling number of issues when you deal with dates and times. I was to far down the road, but if I had it to do over again I would have used Joda Time. They typed in a date in the form of “yyyy-MM-dd” or “yyyy-MM-dd hh:mm:ss” or “yyyy-MM-dd hh:mm”. If they typed 1 argument and it isn’t an integer then I called the “convertStringDateTime” function to try to parse the string. 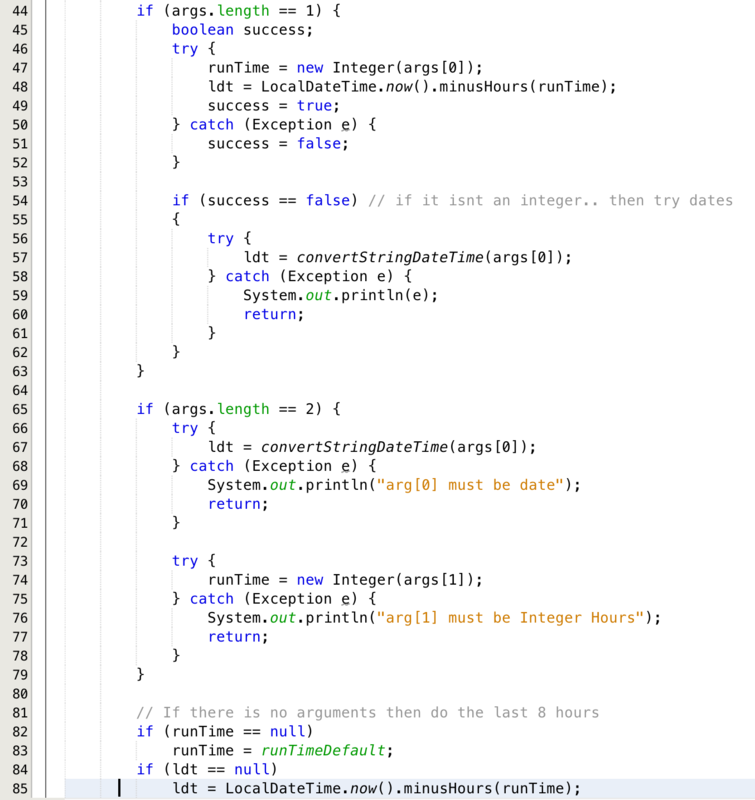 The second argument has to be an integer number of hours and I just use the “Integer(String)” to convert it to a number. If any of these steps fail, then the program exits. The next block of code takes the command line argument and trys to turn it into a date/time. To do this I use the DateTimeFormatter class. Basically I try three different date/time formats to see if I can find one that works. If there is nothing that works I throw an Exception. This function sets up the SQL statement to read the data into a JDBCXYDataset class (from jfree.org) . The JDBCDataset class can be passed to the charting program to create the plot of the data. The function is pretty simple, it just takes the input date/time and number of hours. Then creates an end date/time and embeds that information into the SQL statement. Finally it runs the MySql query and returns the data. The last step is to call the JFreeChart class to build the chart which is done on line 88-96. Once the chart is created, I setup the axis to have a range of 0.0 –> maxDepthChart (If the water is 23 feet deep then my floor is just getting covered ) (lines 98-101). And finally create the PNG file (line 103).